The Derry panel line out in Croke Park last Saturday. Saturday in Croke Park was just the latest ‘banana skin’ safely navigated for Damian McErlain and his players. Cast in the role of party-poopers for Leitrim’s fairy-tale return to headquarters, the horde of media who descended on Terry Hyland post-match bore comparison to more modest numbers waiting on the Derry manager. No one outside the Oak Leaf county was interested in a Derry win. That’s how it was always going to be this year. Criticism was never far from the surface. Scratch even a little and you would uncover apathy, ignorance or worse. And that’s why McErlain and his players deserve so much credit. They have done everything asked of them, and they have done it with a gun to their heads. Critics ignore the mitigating factors which contributed to Derry’s drop down the divisions. Is it just, to give an obvious example, a coincidence that the county’s fall from grace ran almost parallel with Slaughtneil’s emergence as the dominant force in Ulster club football? That rise meant the loss of big numbers of key men for prolonged periods but neither Brian McIver, Damian Barton nor Damian McErlain can control the runaway freight train that is the GAA calendar! Outside the players, management and those who travelled to Croke Park, celebrations were muted, maybe even embarrassed a little, because the county never quite made its peace with being in Division Four, let alone winning it and there’s a snobbery in that. However, this victory can be huge for a group of young players trying to restore former glories; a group which looks like it is on the right track and will be boosted further in coming seasons by another influx of young players with experience of winning provincial titles for their county. That Ulster success at underage levels over recent years proves the talent is coming through and Saturday can be an important first step in getting the senior county team back competing at the highest level. Those with little knowledge of the bottom tier dismiss the eights wins from eight games but as Damian McErlain reminded the press under the Cusack Stand after the game, this is not the Division Four of 1985. 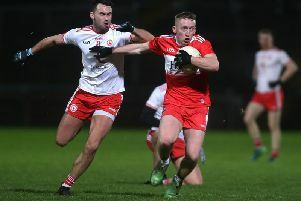 Chrissy McKaigue’s lifting of the Division Four trophy marked a successful first phase of the season but no-one will be under any illusions about how much more difficult things are about to become with the Ulster Championship and old foes Tyrone waiting the wings. Saturday wasn’t perfect and it was notable when Leitrim pressed that the Slaughtneil triumvirate of Brendan Rogers, Chrissy McKaigue and Padraig Cassidy emerged to help their side navigate those difficult periods, aided superbly by club-mate Shane McGuigan’s 0-6 (0-5 of which came from play). Trophies are for winning. Derry fully deserved the win and this group of players deserved the success and also more backing from the county. Before a ball was kicked, people claimed Derry were not a Division Four team and the players have proved that. The question now is can they close the considerable gap to Tyrone before May 12th?